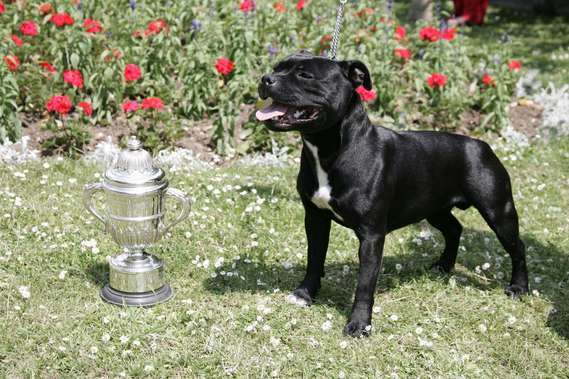 TIGERBULL STAFFORDSHIRE BULL TERRIERS are a small select breeding kennel of top class, quality dogs all of whom have been extremely successful in the show ring with wins at Crufts 2003, 2004, 2006, 2008, 2009 and 2019 but most importantly they are our much loved members of our family with top class temperaments and bred fit for function according to the Kennel Club breed standard. We are Breeders (who adhere to the KC recommendations on breeding), Judges who award KC Challenge Certificates in the breed and Exhibitors who have many years experience within our beloved breed. All our Staffords are genetically health tested clear of L2-HGA/HC and PHPV tested unaffected. Unfortunately, Celt, Lily & Molly are no longer with us having crossed to Rainbow Bridge, but we are continuing with our new kid on the block Rowan (Berrystock Fallen Angel at Tigerbull) in partnership with the famous Berrystock kennels.